The 360° Excavator plant training and assessment programme enables experienced construction site plant operators to gain recognition for their achievements via certification and provides them with the opportunity to demonstrate the skills and knowledge associated with plant operations, leading to suitable certification. The course is of 1 day duration with a maximum of 3 candidates catered for. 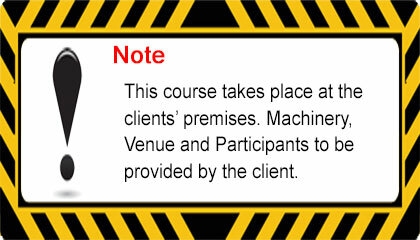 Please note that machinery for all courses is provided by the trainee on the trainee’s premises. Anyone engaged in the operation of a category of mobile construction site plant included in the CSCS Plant Operators Scheme. The 360° excavator operator training is offered in Counties Clare, Galway, Limerick and Tipperary. Candidates must be at least 18 years old, have at least 6 months (within a two year period) full time construction site experience operating a 360 degree excavator, and must have undergone Safety Awareness Training including Employees duties/responsibilities, Health and Hygiene, Traffic Management, and Site Specific Hazards/Safety. Corrective Training:- Candidates will undertake a 3 hour corrective training session with the course instructor. Corrective training cannot give skills and knowledge not held, but allows the experienced operator to eliminate “bad habits” picked up on site. The instructor has the right to refuse the candidate access to the test if they have dangerous operating skills that contravene any part of the Safety, Health and Welfare regulations. Subjects that the questions will be based on will be covered during the corrective training. To be successful in the theory test, candidates must achieve a minimum of 70% of the total available marks. Those candidates who achieve a minimum of 85% will be awarded a credit. 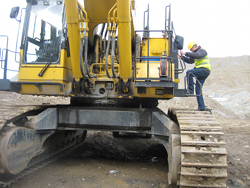 Practical Test:- In the practical test the candidate will demonstrate tasks with the excavator. All practical tasks must be completed within a set time.